When Matt wrote his post the other day about starting a bank it got me thinking about the effect of what he is saying relative to profitability when we introduce a policy to be safe and carry capital reserves of 2 – 3 times more than todays banks. A $4 increase in gross profit results in a 15% higher Return on Equity when a lower capital ratio of 10% is accepted. Note the stock market values ROE over absolute profits. a 12% ($84) loan write down in Safe Bank is absorbed within the $300 capital, leaving them still at a substantial 24% capital ratio versus original 30%. a 12% ($100) write down in Regular Bank eliminates their capital and requires FDIC takeover – THEY ARE GONE! The basic question then is whether the Regular Bank can make up the absolute dollar shortfall relative to Regular Bank of $4 (20% of Regular Bank gross) by efficient operations, less /no branches etc. A 20% improvement seems doeable. This simplistic model is deliberately just that – simple. It does suggest though that there is an opportunity to consider a different model that will still satisfy shareholders, but also satisfy common sense and a more conservative risk profile. Which Bank will step up to this model? Thoughts and critiques from the Basel experts welcome. Note I ignored cost of capital for this exercise. Alos here is the spreadsheet. 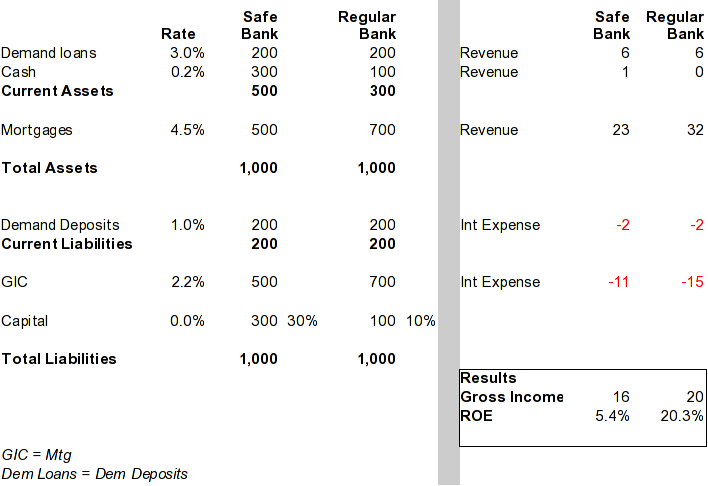 safe bank Note: download, save, and change name to safe bank.xls – then you can open in Excel or OpenOffice.